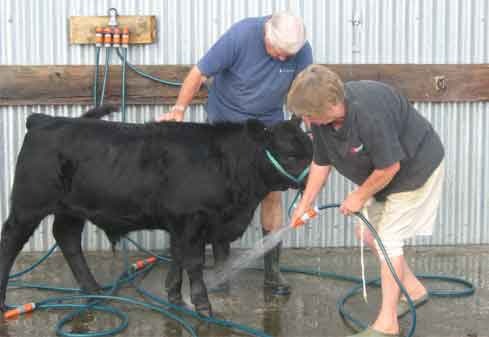 David and Judy Sainsbury of Casablanca Lowline Stud wash down Lowline calf Casablanca Barbary Coast at the Kumeu Show. Contact the Sainsburys and Casablanca Lowline Stud by phone on New Zealand 06 412 2341 or by email. Our physical address is 16 Haunui Rd off Ruatangata Rd which joins with State Highway 3 at the Whangaehu Village between Turakina and Wanganui. There's always a cup of tea or coffee for anyone who wants to talk about Australian Lowline cattle, but please ring to let us know you're on the way.